Shern is 6 months old today. 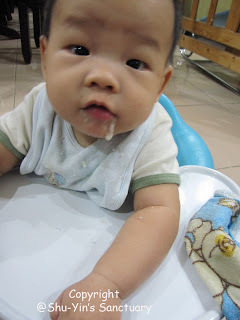 In line with the hugely researched of late and the current recommendation from the World Health Organisation (WHO) that: no solid foods are introduced to baby for the first 6 months, I have breastfed Shern exclusively until yesterday. 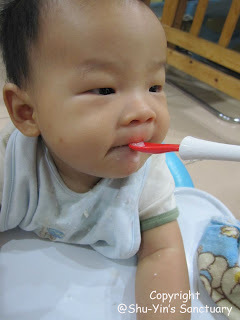 Shern had his first solid food yesterday - 5 December 2009. I have decided long ago to make homemade food for Shern as much as possible. It is really simple. All you need is a blender and a little effort and a lot of love. 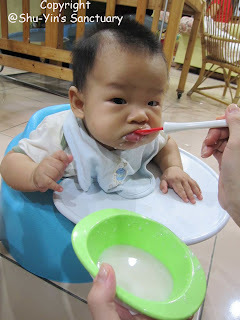 I decided to introduce wholesome rice cereal to Shern as his first food. 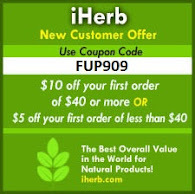 Took this recipe from http://www.homemade-baby-food-recipes.com/. To make the rice powder, grind brown rice in a blender or food processor. Add the rice powder, stirring constantly with a wire whisk. Simmer for about 10 minutes (don't forget to keep stirring, or the rice will stick). 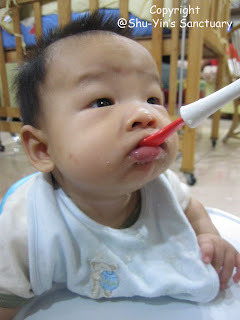 Then stir in enough formula or breastmilk to give the consistency that's best for your baby. I chose to use brown rice because it is a more wholesome, nutritious and healthier choice compared to white rice. I find it takes a little longer and more water to cook than what the recipe suggested. 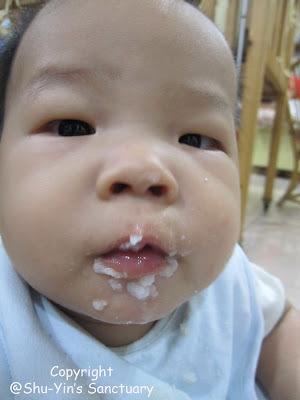 I heard from friends and read from the books and internet that usually babies don't really eat their first solid meal. They are actually just learning how to eat with a spoon. Learning how to push the food from the outside to the inside of their tongue before swallowing them. 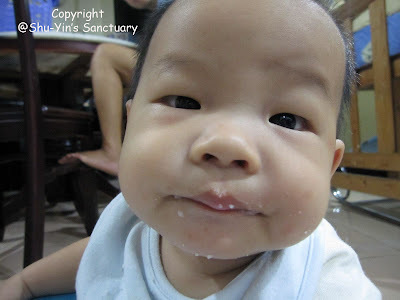 But Shern is REALLY eating his first solid meal. Yes! He seems to be swallowing a big portion of it. Haha! First, I put him on pho-pho's lap. 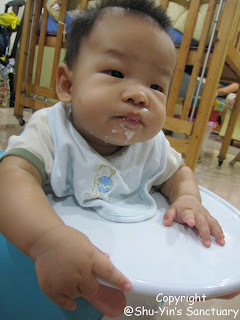 He took his first few mouthful. He seems to love it so much and can't wait for more 'til he even licked the bowl. See this video. Then I put him in his Bumbo Seat and we continued the rest of the feed there. 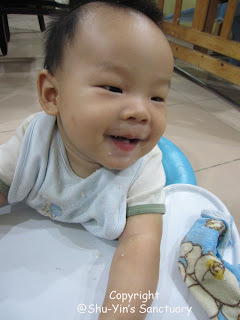 He was sitting there happily enjoying his first food. See this video. 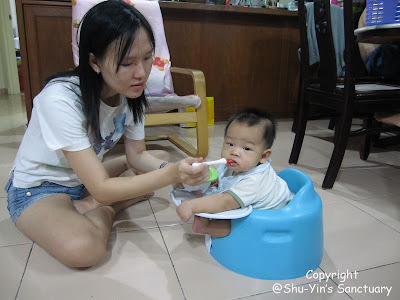 I find with him sitting on his Bumbo Seat makes feeding him easier. I am loving this Bumbo Seat more and more. 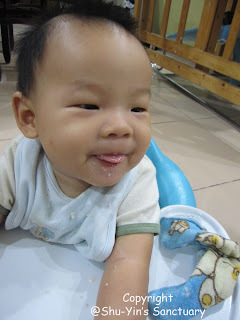 eh mama shuyin..from the Shern's facial expression in the first video it is obvious that your baby food is not nice. 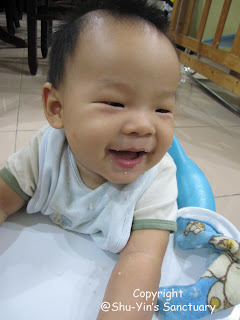 i wish Shern can talk and reply -- Duh..it's not nice mummy..so that will save ur saliva on asking -- nice or not, nice or not.